It took four years to revive an early 1900s flatiron-style building in San Francisco’s Mid-Market neighbourhood into one of the coolest new luxury boutique hotels in San Francisco. The San Francisco Proper Hotel markets itself as “a collage”, melding together a historic listed building with a “modernist-flavoured” reimagined interior by renowned designer Kelly Wearstler. The hotel, which opened late 2017, became the first major high-end designer hotel to grace San Francisco in close to a decade. The hotel’s 131 guestrooms and suites range from bunk rooms to premier suites. Each room has a creative and eclectic feel, pairing modern and vintage pieces. The rooms are all filled with steams of natural light which pours in through the historic windows. First things first, the plush locally- made mattresses from Aireloom and silky linen from Bellino will help ensure a peaceful night’s sleep. Then moving into the bathrooms you will find the counters generously stocked with botanical bath amenities from the Melbourne-based skincare lab Aesop. True to the tech city’s roots, each room is fitted with smart technology and sleek wireless speakers. The food and drink scene at the hotel is strong. The hotel’s main restaurant, Villon sees Executive Chef Jason Franey use Bay Area sourced ingredients in globally-inspired dishes. 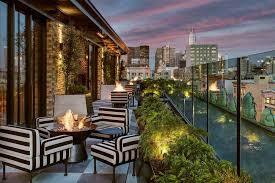 In true San Francisco style, a rooftop bar known as Charmaine’s boasts views over the city skyline and the bay. Here, the chic of a European terrace meets laid-back California cool. Creative cocktails can be enjoyed on the stylishly striped lounges and under the warmth of the fire pits. There is also an all-day cafe and market called La Bande dishing up freshly made delights.